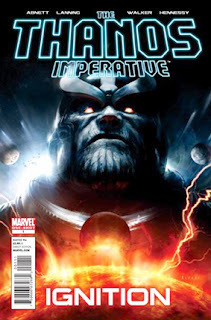 • PLOT SUMMARY: Thanos is back! On one side you have the Marvel Universe's #1 threat! On the other: a dark new force determined to obliterate everyone! In the middle are the outnumbered and battle-hardened heroes that stand between us and complete decimation! A war has ignited which will combine the galaxy's most dedicated warriors with a collection of heroes that you never saw coming! It's a battle that will span the cosmos, deliver major shocks, and will prove to you why IGN proclaims 'Dan Abnett and Andy Lanning can seemingly do no wrong' and Aint It Cool News raves that Abnett and Lanning consistently deliver 'terrific action, interesting character development, and some pretty good jokes all rolled into one amazing package.' Written by DAN ABNETT and ANDY LANNING. Art by BRAD WALKER. Cover art by Aleksi Briclot.